At Illyriad Games we run a tight ship with low dependencies and we need to know the costs, risks, advantages and disadvantages of everything we include and use. Being a very small studio, this is super-important. This doesnâ€™t mean not using the right tools for the job, or rejecting things because they werenâ€™t invented here: it means the exact opposite. Even our projects are a mix of different types as each one is suited for a different need (see image). Indeed, we like open source as it gives us the best of both worlds: a great diversity of minds from all around the world with wider viewpoints then our own â€“ including specialists in their field â€“ and with the ability to contribute if we need changes or fixes to suit our more particular needs. Generally the community will improve and build on our contribution; enriching it for better code for all. Much like life; diversity is a good thing! This is one of the reasons we are quite excited by .NET Core and ASP.NET 5. They are both open source as well as being leaner and more modular â€“ meaning we only need to include what we use. Itâ€™s also cross platform and has all sorts of other goodness. So, in that spirit, today Iâ€™m looking at our build process and seeing if there is any way that it can be trimmed. We currently use Gulp for the task, though you can use Grunt and probably other things if they suit your needs better. Thatâ€™s only 24 folders; but how many is that really? 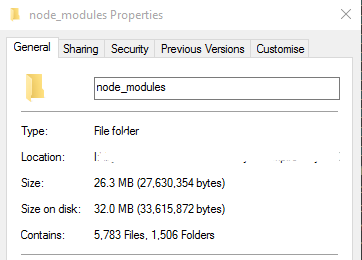 So the 20 modules we use require 62MB over 15k files and 4.2k folders to work. 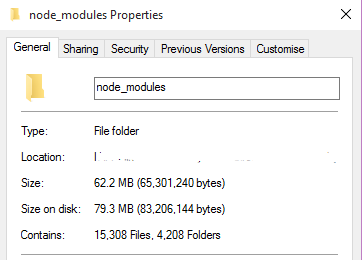 Seems quite high; some of this is that modules that use other modules have their own node_modules directories, and they are included recursively. Is there anything we can do to reduce this? Turns out there is. Just in caseâ€¦ Make sure you back up your project! Your dependencies will now be installed maximally flat. Insofar as it is possible, all of your dependencies (and their dependencies, and THEIR dependencies) will be installed in your projectâ€™s node_modules folder with no nesting. Bear in mind npm 3 is currently in beta. So you may find some issues using it. Now your npm version should be the most recent. Next, upgrade all version numbers to most recent versions in your projectâ€™s package.json. Visual Studioâ€™s editor makes this pretty easy; delete the current version number and itâ€™s surrounding quotes, open a double quote and it will give you a drop down with a list of the recent versions to choose from. Save and close the project. Now you can open your project in Visual Studio 2015, wait for it to do its package restore magic; not sure of the exact steps for this (if its auto-magic on project open, or open and edit package.json, then save it). You can follow the progress in the Output window in the Bower/NPM section. Once this has finished, close the project. 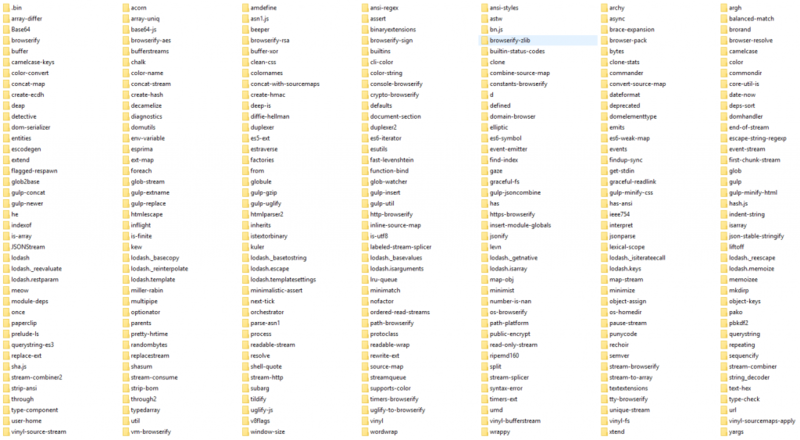 26MB over 5.7k files and 1.5k folders. 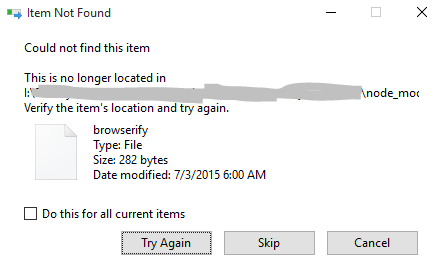 That means disk space is down by 60%; file count is down by 62%; and folder count is down by 64%. So actually its a pretty good improvement! Which makes sense as its due to a version conflict with our directly included through2 as its a full version bump. More importantly, with this comes greater knowledge of module dependencies, risks and costs. For the convenience this gives us for our build steps, this is a price we are more than happy to pay. However, if it was a runtime cost because we were running a node.js or io.js server; it would certainly be something Iâ€™d want to look at more closely! Also understanding your true dependencies can be very important from a security standpoint.